New work in preparation for Jeremy Huw Williams. The Welsh baritone Jeremy Huw Williams studied at St John’s College, Cambridge, at the National Opera Studio, and with April Cantelo. He made his debut with Welsh National Opera as Guglielmo (Così fan tutte) and has since appeared in more than sixty operatic roles. He has given performances at major venues in North and South America, Australia, China, Hong Kong, and most European countries. He has given recitals at the Wigmore Hall and Purcell Room, and at many major music festivals. He frequently records for BBC Radio 3 (in recital, and with the BBC NOW, CBSO, BBC SO, BBC SSO, BBC Philharmonic and BBC CO), and has made many commercial recordings, including ten solo discs of songs. As a principal singer with Welsh National Opera he appeared at the opening night of the Wales Millennium Centre, and received the inaugural Sir Geraint Evans Award from the Welsh Music Guild. He was awarded an Honorary Fellowship by Glyndwr University in 2009 for services to music in Wales, and received the Honorary Degree of Doctor of Music from the University of Aberdeen in 2011. 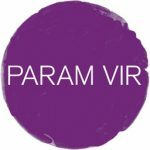 Param Vir is supported by PRS Foundation. Lie glimmering in vast expectancy. Light, timeless Light immutable and apart! Quivers in my heart where blooms the deathless rose. Light in its rapture leaping through the nerves! A living sense of the Imperishable. Joining my depths to His eternal height. The quiet welter of a shifting world. Escapes the mind ere it is caught. From behind the veil ran out. Up to the hill and the moorland I go. Who will come with me? Who will climb with me? Wade through the brook and tramp through the snow? Against me the wind and the storm rebel. Of misadventure have made me a friend. Who would live largely? Who would live freely? Here to the wind-swept uplands ascend. I am the Spirit of freedom and pride. Who shares my kingdom and walks at my side.